UCx Wallboard application gives Call Center personnel the ability to instantly assess the call center operational performance at any given time. This optional application displays key performance indicators and statistics from the call operation among Agents belonging to a certain queue. Supervisors can more easily identify operational issues, address agent training needs and improve customer experience. 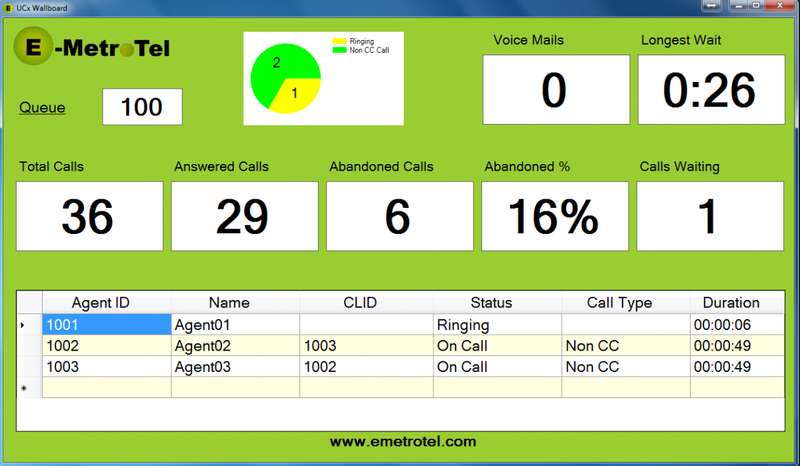 New Voice Mails: Total number of voice mails in the specified mail box. The following information regarding Agents are also displayed, while they are established on a Queue or Non Queue call. This information is displayed for all agents belonging to the Queue selected. Status: Status of the call, like Idle, Not Ready, Not Available, On Call etc. Call Type: Type of the call established, like CC or Non CC call.